American clothing brand Ed Hardy, known for its rock 'n' roll- and tattoo-inspired prints, opened its first boutique here (above) for its diffusion line, Hardy Hardy, on July 30. The 780 sq ft boutique at Bugis+, also the first Hardy Hardy store in South-east Asia, sells clothing, bags and accessories for adults and children, including those from the Spring/Summer 2016 collection. Prices start from $39 for an accessory pouch to $1,069 for a men's leather jacket. Prices for children's clothing start from $59 for a T-shirt to $399 for a woven jacket. Hardy Hardy is located at Bugis+, 201 Victoria Street, 01-18, open daily from 11.30am to 9.30pm. British fashion retailer Marks & Spencer launches its new boutique concept at Parkway Parade today. The other store at Raffles City Shopping Centre will reopen next month. The stores will have larger mirrors and warm lighting for a more comfortable shopping experience. Aside from the usual lingerie, womenswear and menswear offerings, the 17,222 sq ft Parkway Parade boutique will have kidswear and a bakery with coffee to go, similar to its outlet at The Heeren Food Hall in Orchard Road. A women's T-shirt starts from $19.90, while a men's suit jacket starts from $159.90. The new Marks & Spencer boutique concept stores are located at Parkway Parade, 80 Marine Parade Road, 02-28-32, open from 10am to 10pm; and Raffles City Shopping Centre, 252 North Bridge Road, 02-01, open daily from 10.30am to 10pm. American beauty brand Laura Mercier has released a new highlighter it claims will help users get a subtle glow and radiant look. The Face Illuminator has a lightweight powder formula which is easy to apply and creates a soft, smooth finish. It provides a transparent wash of colour that the label says will last eight hours. It contains pure light-reflecting pigments that is said to create a multi-dimensional luminous finish. It is available in three shades: Devotion (cool pink), Indiscretion (warm rose gold) and Addiction (warm bronze). The Face Illuminator ($73) is available at Laura Mercier counters and Sephora stores. 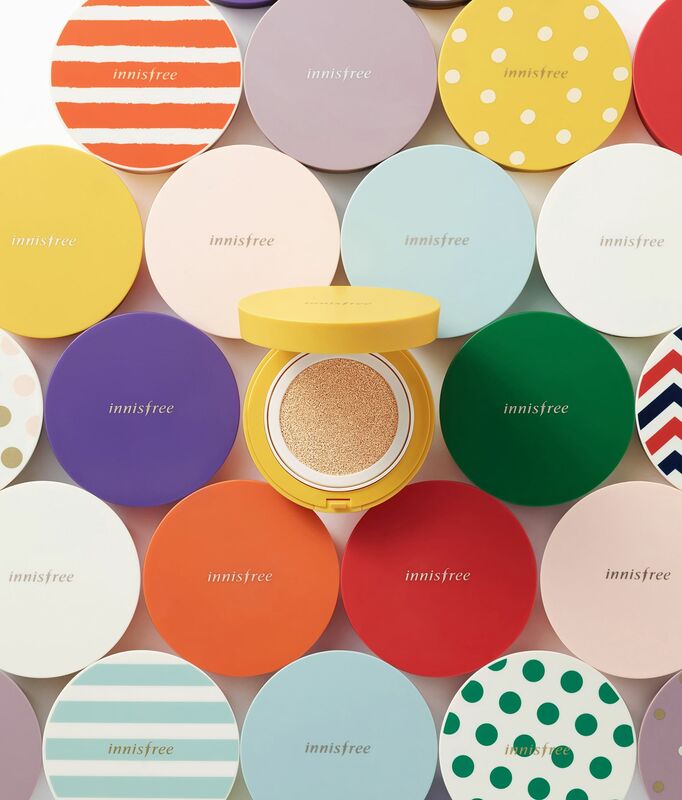 South Korean label Innisfree users can now customise their cushion compact foundations. The brand has launched a collection of 100 cushion case designs that come in a variety of colours and graphic prints (above). It has also launched two new cushion types: the Long Wear Cover Cushion and Water Fit Cushion. The former is infused with Jeju volcanic powder, which the label claims helps with sebum control to ensure long-lasting coverage and a soft, matte finish. The latter is made from 100 per cent organic green tea water from Jeju, which the label claims gives a moisture boost to the skin. To customise their cushion compacts, customers can select the cushion refill of their choice ($19 each), pick a case ($12) and choose from four applicators: Glow Puff ($3), Fitting Puff ($3), Cover Stamping Puff ($8) and Cushion Brush ($15). The 100 case designs are available at Innisfree outlets at Takashimaya Shopping Centre, 391 Orchard Road, B2-34; and VivoCity, 1 Harbourfront Walk, B1-02. Other Innisfree stores carry only 40 designs. Online fashion retailer Zalora has added 16 South Korean fashion labels to its roster of brands. Customers can shop from a wide range of menswear, womenswear and accessories from labels such as sophisticated accessories brand Lapalette (above), unisex brand Nohant and minimalist womenswear brand Wnderkammer. Prices start from $30.90 for a canvas pouch from accessory brand Rawrow to $549.90 for a watch by Eone or a linen dress from Lucky Chouette.